This image is an excerpt from a present day Spatanburg City and County Map. 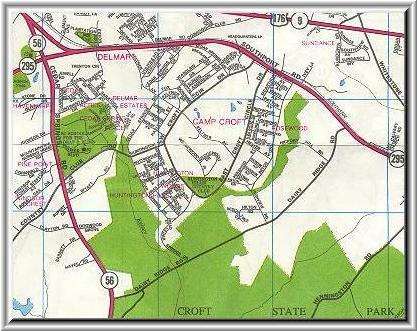 This shows the cantonment area of Camp Croft which was developed into the Camp Croft Subdivision years ago. It is interesting to note that all of the old camp roads are still intact with very few additions. The rather odd shaped boundaries of Croft State Park are visible below the area in green..